Emily Monahan, 18, an Aquarius and a Jersey girl (and a recent high school graduate), submitted this one. "I've marched four years with the Marlboro High School Marching Band (two years on clarinet and two years on trombone) and one year on baritone with Jersey Surf. "I found this picture on my computer of me and my best friend, Matt Spielman. This was in Denver on the night of semifinals. 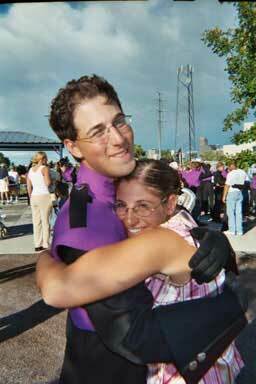 He's the reason why I got involved in drum corps and I am eternally grateful for it! Matt marched Phoenix in 2003 and we both joined for the 2004 season. I must admit, he did a pretty good job of convincing me to join. "Unfortunately the corps went inactive in 2004 so he marched baritone with the Magic and I marched baritone at Jersey Surf. I decided to take this summer off so I could work and prepare for college. Matt is marching his ageout year with the Crossmen on euphonium. I wish him and the rest of the corps the best of luck this summer!" Thanks Emily!